Drones! They're doing it all these days! Creating artistic light show / circuses, patrolling borders, airlifting contraceptives to oppressed women, and so much more. Now, our little flying friends have entered the next logical phase of what happens when humanity finds something agile, competitive and able to be technologically souped-up: we're racing them. What's the Vegas betting line on little flying robots? The world may soon be enthralled. According to Inverse.com, humanity's first World Drone Prix will take place on March 11th in (where else?) Dubai. With a million-dollar purse up for grabs between the winners, this isn't some simple spin through the skies. It's being run by W.O.R.D. (the World Organization of Racing Drones), the quadcopters involved are nearly faster than a spectator's eye can follow, and the sky is the literal limit for the bells and whistles that you can use to pimp out your flying ride. 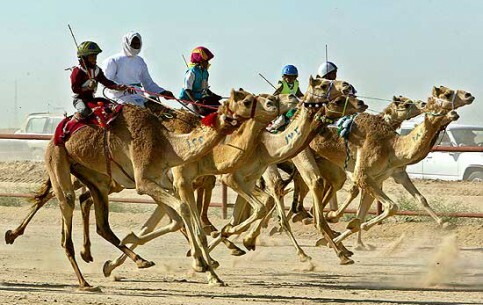 It's slightly more high-tech than Dubai's other favorite form of racing. They proudly proclaim, "32 best pilots from around the world will race for the win over Dubai 2016 Aerial Track, the first and only of it’s kind. A thrilling competition will unfold in front of a local audience, and the entire planet, marking the official birth of the sport of the future." The competition will advance 8 racers to the semi-finals, in which 2 rounds of competition will pit 4 pilots in the finals. The winner will take home a $250,000 purse (with lesser purses going to the top 8 winners, and other prizes of $100,000 each for Best Team, Fastest Lap, and a Constructor Award), plus a massive amount of nerd street cred, and likely a reprieve from duty when the robots finally take over and begin racing humans for THEIR their entertainment. In the further future, this fancy fellow will be YOUR jockey. Some wider audiences do seem to love racing.